Rewind to the early Roman and medieval times, a wall was erected around the city center, today known as the Gothic Quarter, and a sandy riverbed (“ramla” in Arabic) acted as both a moat and a sewer system. On the other side sat covenants, then houses, then schools. When the riverbed dried up in the fourteenth century, people began using it as a road, and by the late 1800s, it began to be designed into the proportionate, “emotional hub” that it is today. Las Ramblas now separates El Raval (a diverse, immigrant heavy, historic neighborhood) and Barri Gòtic (the old city) with a tree-lined path connecting the Columbus Monument to the “City Center,” Plaça de Catalunya. Among the heavy flow of people, one might notice an oddity along Las Ramblas: men, usually of African decent, with large, bulky sacks slung across their backs. 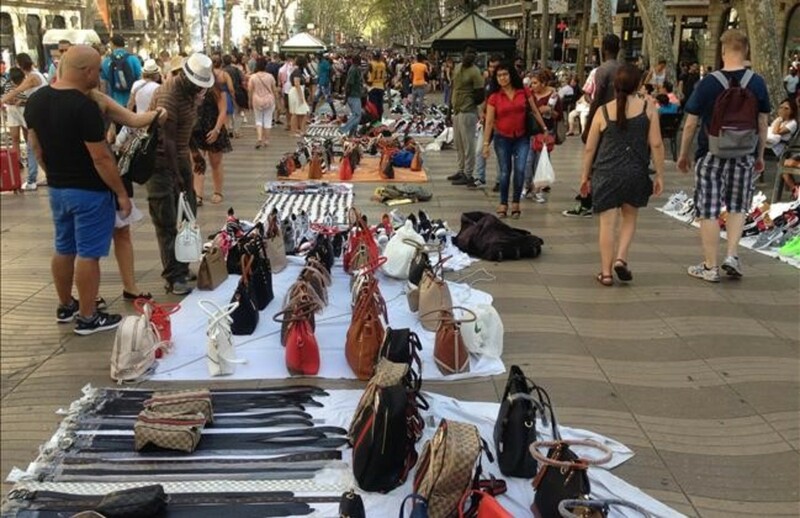 If you were to follow them, you would find them selecting a location to spread out this sack (a white blanket) only to discover loads of name-brand shoes, purses, clothing, and Barcelona keepsakes. These men are the Manteros (blanketmen). Manteros “divide opinion in the city,” according to a BBC news article. They are unlicensed workers and do not pay tax, which, according to local businesses, is “unfair and illegal competition.” Some may say that “anti-mantero sentiment is fueled by distrust of immigrants.” However, one local business owner refutes the statement by iterating that Barcelona “is a city made by immigrants.” This statistic can be seen in a January 2013 study of Barcelona Immigrants, where we see that in Ciutat Vella (where Las Ramblas is located) 42.6% of residents are immigrants. Las Ramblas has a medieval history, one that began in the gutter and then bloomed into the luscious gathering space of today. Though it struggles with pick-pockets, prostitutes, and men with cheap fare wrapped up in blankets, it still remains one of the main attractions of Barcelona. Alexander, Christy and Lori Tang. Las Ramblas, Barcelona, Spain. n.d. PDF. <http://courses.be.uw.edu/SDMasterStudio/wp-content/themes/gehl-studio/downloads/Winter2010/LasRamblas.pdf&gt;. Barcelona Immigration Statistics. 25 August 2017. January 2017. <https://homagetobcn.com/barcelona-immigration-statistics/#jp-carousel-7935&gt;. Madi, Mohamed. Barcelona’s ‘blanket men’ try to rebrand. 7 December 2017. January 2018. <http://www.bbc.com/news/world-europe-42256346&gt;. Next Authors, Artists, and Anarchists. . . Catalonia During the 1900’s. . .